Transportational integration at Flintholm Station. The shiny new Metro up top, the bike/wheelchair/pram compartment of a local S-train in the foreground. I couldn't get the busses in the same shot. 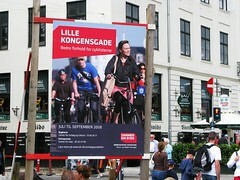 A typical public service poster from the City of Copenhagen informing citizens that "Better conditions for cyclists" are on the way in Lille Kongens Street, using a photo representative of average Copenhageners. 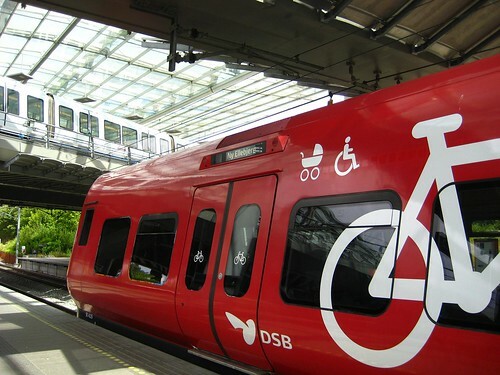 The city of Frederiksberg - an independent city within Copenhagen - is in many ways ahead of the game regarding bike friendliness. 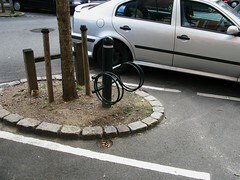 They are constantly setting up bike racks in the residential areas to encourage people to stop leaning their bikes up against the buildings. Every cosy space can be used. They reclaimed parking spots in this street in order to plant trees and, in the process, installed two or three racks in every space. Almost all of the racks down the street were in use. The City of Copenhagen is soon launching rackless bike parking in the centre of the city since bike racks take up too much space and most bikes have kickstands anyway. More on this when it happens. 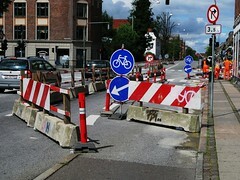 When roadworks are necessary, the cyclists are not forgotten. My mate Mikkel from Kommunikationscast - a weekly podcast on communication in Danish - took this photo outside of his flat. 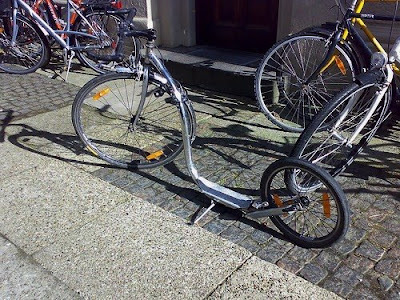 A scooter [løbehjul in Danish] for grown-ups! How fun is that!